Our Fyvie Florists not only arrange absolutely stunning bouquets but they can also arrange for a gift to accompany your flowers as we have a handy gifts range on offer here. Our gifts range includes a selection of delectable wines and champagnes perfect for occasions such as birthdays and romantic dinners; delicious Belgian chocolates if your recipient has a sweet tooth; adorable and silky soft teddy bears perfect for new born babies; fruit baskets that can be arranged in different sizes as well as balloons. Our Fyvie Florists are able to arrange lovely balloon bouquets which are usually composed of three plain balloons and three with a fitting phrase for your specific occasion. Our Fyvie Florists want to do as much as they possibly can for you and will always go above and beyond when it comes to customer service. The bouquets our Fyvie Florists arrange are absolutely stunning and unique in their own way - the flowers used have all be directly imported to us from our suppliers in Holland to ensure premium quality. Not only are our flowers of the best quality but they are also the freshest as we sometimes have up to four deliveries per week. This means our flowers have a high longevity and your recipient will be able to enjoy their flowers for many days to come. Our Fyvie Florists work with a huge array of flowers to create gorgeous bouquets which are all finished off with an artistic flourish as our Fyvie Florists wrap the bouquets in papers, tissues and ribbons. Alternatively, your flowers can be arranged into a complementary box or vase depending on what sort of finish you're after. 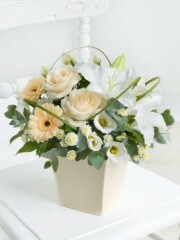 Our customers are also able to personalise bouquets by adding personal messages or using our bespoke service. The bespoke service allows our customers to work in collaboration with our Fyvie Florists in order to create the perfect bouquet for your recipient. No matter how big or small your request is, we want you to know that our Fyvie Florists will do everything to fulfill all your floral wishes. 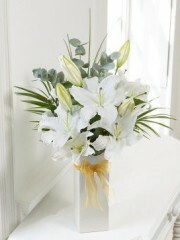 Once your order has been arranged by our Fyvie Florists, we are able to have your flowers delivered to any address as we are part of the Interflora delivery network. Through Interflora we are able to deliver not only locally but nationwide all over the UK as well as abroad to over 140 different countries worldwide so no matter where your recipient is, your flowers will be delivered in immaculate condition to your desired location. The delivery drivers - both local and international - do their absolute best when it comes to delivering your flowers by driving carefully and safely on the road in order to prevent damaging your flowers. We offer our customers several different delivery services for your convenience which includes our standard delivery service which runs weekly every Monday to Saturday, our next day delivery service as well as our same day delivery service. The same day delivery service allows our customers to place an order and have it delivered on the same day. This means that our Fyvie Florists arrange your bouquet on the day which is why, in order to use this service, your order must be placed before 3PM to give them enough time to get everything sorted for you. Once your order has been placed, our Fyvie Florists will take care of everything on your behalf so you don't need to worry about a thing.